That's right! Comics for Grownups will attend the Motor City Comic Con in Novi, Michigan this year! I paid three hundy and they gave me a table. I'll be there to sign your book and rap with you if you want! This may be the only con I attend in 2017, although I am thinking I should try to go to another one. Getting the books out in front of people and seeing wht they think is probably the next step. That, or advertising, and I have a couple of ideas in that regard. 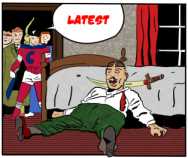 In this week's page we have even more action! I'm getting the feeling that this may be the climax of the story. No, it didn't really seem to have exactly the same stuff that we saw in the splash at the beginning of the story, but most of it is there. And yeah, once again we are forced to wonder where Squeeks the Monkey got to. Maybe Crimebuster left his monkey at home... yeah, it would have been a little weird for a police officer to be walking a beat with a new world monkey. Published on February 17, 2017 by Sam Battin. The thug in red hops on the running board and yells at the driver, "Make it snappy! I can hear a police siren!" Joe crawls out of the manhole last. Crimebuster stumbles, falls again. The figure of Joe comes in front of him, and he grabs, finding Joe's leg. Crimebuster instinctively grabs the toe in one hand, the ankle in the other, and pulls. Joe falls and his neck makes a crack sound. The green gas truck pulls off, leaving a ripped hose dragging behind, one thug still on the running board. The driver looks in the mirror, says "He didn't make it! That punk cop has him down!" The guy on the running board says "Keep goin'! It's his hard luck!" Crimebuster watches the truck rumble down the street. "They're getting away! I gotta stop 'em!" Heedless of his own safety, and the safety of anyone on the street, and the safety of anyone who happens to be asleep in any of the buildings that line the street, Crimebuster strikes a long kitchen match on the concrete and chucks it at the puddle of ten cents a gallon gas. He gets lucky; it catches, and the fire zips along the puddle of gas until it reaches the hose, and the several hundred gallons inside the gas truck. The gas truck goes up on two wheels, and the guy on the running board feels the heat burning the hair on the back of his neck. "The whole truck's afire!" he yells, "It's gonna blow up! Jump, or you won't stand a chance!" An explosion is what happens when something gets really big, really fast. In this case, the fire causes a chain reaction among the ten cents a gallon gas molecules. Each one combusts, creating heated gas as the gasoline molecule splits apart, which draws oxygen into the truck, and violently shoves aside more gasoline molecules, until suddenly there's no room left in the gas truck's tank, and it violently separates to make room for all of the burning gas. Crimebuster watches, silently. He turns his body away from the shockwave. He is watching to ascertain whether those things in the heart of the explosion are machine parts or human parts.